The passenger compartment of the Tiguan remained stable in the frontal offset test. 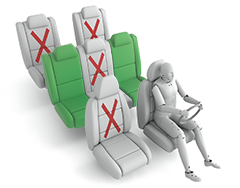 Dummy readings indicated good protection of the knees and femurs of both the driver and the passenger. VW showed that a similar level of protection would be provided to occupants of different sizes and to those sat in different positions. In the full-width rigid barrier test, protection of the driver was good for all critical body areas and was good for the rear passenger except for the chest, protection of which was marginal. In both the side impact barrier test and the more severe side pole test, the Tiguan scored maximum points with good protection of all critical body regions. 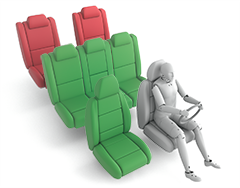 Tests on the front seats and head restraints showed good protection against whiplash in the event of a rear-end collision. A geometric assessment of the rear seats showed that occupants would also be well protected in those positions. The Tiguan has an autonomous emergency braking system as standard and tests showed it to be good at avoiding or mitigating low speed accidents where whiplash injuries are often caused. In the frontal offset and side barrier tests, both dummies were properly restrained throughout the impacts. In the frontal test, protection was good or adequate except for the chest of the 6 year dummy, for which dummy measurements of deceleration indicated marginal protection. In the side barrier test, protection of all critical body areas was good for both the 6 and 10 year children. The front passenger airbag can be disabled to allow a rearward-facing restraint to be used in that seating position. Clear information is provided to the driver regarding the status of the airbag and the system was rewarded. In Euro NCAP's installation tests, all restraints could be properly installed and accommodated by the Tiguan. However, the third-row seats of the Tiguan 'Allspace' failed the installation check for universal child restraints. The Tiguan has an 'active' bonnet, where sensors in the bumper detect when a pedestrian has been struck and actuators lift the bonnet to provide more clearance to the stiff engine components. However, the Tiguan 'Allspace' does not have an active bonnet so tests of head protection have been repeated. Results were good or adequate in most test areas and the score is only slightly reduced compared to the 'active' hood originally tested. The bumper showed good results at all test locations and scored maximum points for its protection of pedestrians' legs. However, the pelvis area was not well protected, with poor results at almost all test locations. The autonomous emergency braking system is able to detect vulnerable road users such as pedestrians and performed well in Euro NCAP's tests of this functionality. Tests of the autonomous emergency braking system at highway speeds demonstrated good performance, the impact in most cases being avoided or mitigated. The Tiguan has a standard-fit seatbelt reminder system for the front and rear seats and also a lane assistance system that helps to correct the deviation when the car is drifting out of lane. A speed assistance system is also available but, as it is an option, it was not included in this assessment. 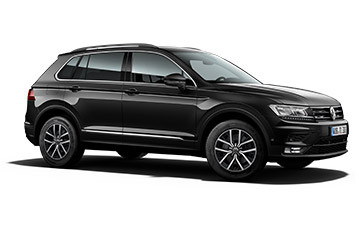 The 2016 rating for the VW Tiguan now also covers the three-row Tiguan 'Allspace'. Additional tests have been performed to cover the differences between the two-row base vehicle and the three-row 'Allspace', and the score has been updated accordingly.